Emma Pooley and Ruth Holdaway discuss the gender gap in sports prize money, sponsorship and funding. Imelda Staunton on her role in Gypsy. Rae Morris sings 'Closer'. Silver Olympic medalist Emma Pooley and Ruth Holdaway from The Women's Sport and Fitness Foundation discuss the gender gap in sports prize money, sponsorship and funding. Imelda Staunton on her role in Gypsy. Rae Morris sings Closer and tells us about her inspiration for the song. What can Jane Austen's heroines teach us about dating today? 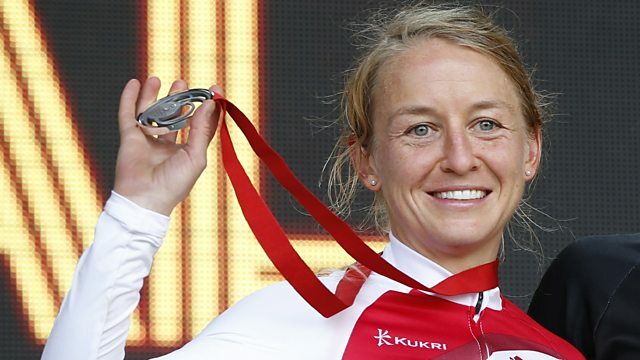 Campaigner Ruth Holdaway and cyclist Emma Pooley on the prize money gender gap. The actress on playing Momma Rose in the musical Gypsy and pushy stage mothers. Psychologist Laverne Antrobus and journalist Heidi Scrimgeour discuss dummies for kids. The 22-year-old singer-songwriter talks to Jane and performs her new single, Closer. Writer Sinead Murphy on what Jane Austen can teach us about modern relationships. The London 2012 Olympic Games were supposed to deliver a legacy of greater equality in sport – but, two years on, women are still waiting on equal prize money for competitions. We discuss sponsorship, funding and the prize gender gap with Ruth Holdaway from The Women’s Sport and Fitness Foundation and Olympic cyclist Emma Pooley. Imelda Staunton is currently starring at the Chichester Festival Theatre as Momma Rose in the Sondheim musical, Gypsy. Having won rave reviews, she joins Jane to unpick the complex character that is her latest role. With her own daughter in drama school, are there any links between Imelda and the ultimate pushy stage mother she plays? When Victoria Beckham was spotted at the end of last week with her three-year-old sucking on a dummy, she was accused by health experts of damaging her daughter’s wellbeing. Dummies are intended to help settle a restless child at bedtime and the NHS recommends parents stop the use of them by the age of 12 months. However, some parents use them to stop a child crying or because it’s simply become a habit. So could that habit actually stunt a child’s speech? Or can dummies or soothers continue to play a limited role? Jane is joined by Laverne Antrobus, consultant child and educational psychologist at the Tavistock Clinic in London, and journalist Heidi Scrimgeour from Playpennies website. Rae Morris is one of the most in-demand new singer-songwriters in the UK. The 22 year old from Blackpool was the headliner at BBC Introducing Stage at Reading and Leeds Festival in August, where she also appeared in 2011 at the early stages of her career. Her lustrous and emotive tones have received critical acclaim and she’s been compared to acts such as Cat Power and Feist. Rae joins Jane Garvey to talk about her musical inspirations and to perform her new single Closer. The single Closer is out now and Rae's debut album will be out in January. She is performing in Cardiff on 30 October. What do Jane Austen novels written 200 years ago have to teach young women about modern relationships? A great deal, according to Sinead Murphy, the author of "The Jane Austen Rules - A Classic Guide to Modern Love". Written as a sharp critique of modern dating guides, Murphy, who is a young feminist, academic and mother of two, argues that Jane Austen was herself a feminist whose strong heroines could be inspiring role models for contemporary women. She joins Jane to talk about the 10 Jane Austen rules which can help women navigate the ups and downs of courtship and dating. "The Jane Austen Rules - A Classic Guide to Modern Love" by Sinead Murphy. Published by Melville House.